It's never a good day when my son's NDIS plan comes up for review. NDIS is the National Disability Insurance Scheme which provides funding for my son with autism's treatment. Medicare only provides partial funding and my private health insurance gives us a whopping $500 each year to use. With a weekly occupational therapy session that costs $176, not to mention speech, food and anxiety therapy, making ends meet is virtually impossible for special needs families. And I haven't even factored in the enormous cost of his special needs schooling. I know of countless families whose children haven't received any NDIS funding for a variety of stupid reasons. Another was told her son should get a job, which considering his limited communication and obsession with talking to budgies might be difficult. Then there's our friends at the therapy office whose children are way more challenged than my son is, who were rejected from the program entirely. For those of us 'in the system', NDIS is a sh-t show, a plethora of mismanagement and nonsensical decisions that leaves Australians with disabilities in a worse position than what they were before the scheme was launched two years ago. I suppose we should be more grateful for the scraps being thrown at us. Our children who have been born with disabilities -- through no fault of their own -- should be thankful for the limited funding and services being offered to them. After all, it's not everyone else's problem. The welfare of every single Australian, particularly children, should be everyone's concern because we are all ultimately impacted by the choices made on all of our behalves and the consequences of them. Stop me if I'm boring you. I wouldn't want to bore you with my problems. I receive so many messages from people telling me to shut up and stop talking about my children. Excuse me if I ignore such requests. 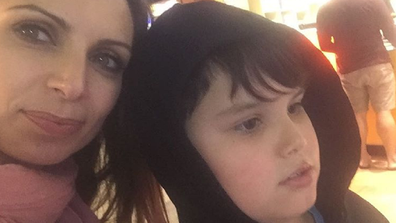 Most special needs families are exhausted from the grind of daily life. Many are too afraid to go public with their experiences. I share stories for them, because I can. Which is why I am sharing the most recent email I received on behalf of NDIS, because to me it is a big, giant flag and I want to warn special needs families to be prepared. NDIS is coming for anyone who is caught scamming the system. The scheme hasn't figured out how to provide funding for everyone who needs it yet, so devoting resources to catching those taking advantage of it is clearly a good choice. Please make our lives even more difficult than they already are. "Good afternoon": You are lucky I am contacting you at all. "I am contacting you in regards to your NDIS plan": You know the money we gifted you, which you have been spending on luxury cruises? "It is due to expire 1st November": The money we gave you didn't last until 1st November but any-hoo, we have a few million hoops for you to jump through before you get any more. 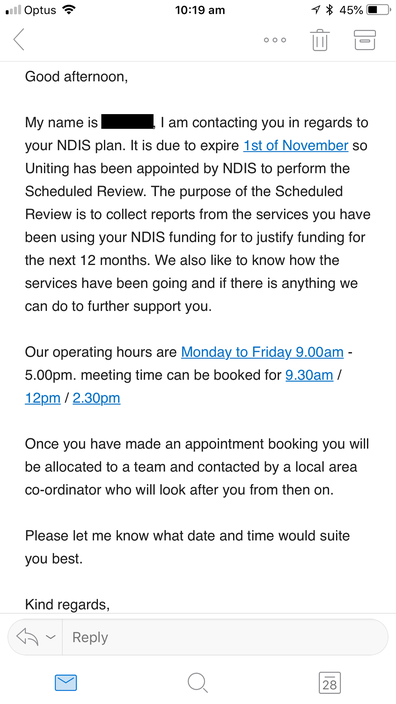 "Uniting has been appointed by NDIS to perform the Scheduled Review": I have never heard of you or autism before, nor am I going to bother to read your file or Google 'autism' ahead of our meeting, because I am new and don't know what I am doing. Plus I am the third different planner you have had to deal with in the past two years. So you already know you aren't very important. Maybe I'll show up for our meeting, maybe I won't. 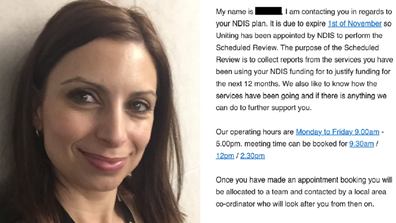 "The purpose of the Scheduled Review is to collect reports from the services you have been using your NDIS funding for": Please do all of my work for me in your spare time. "To justify funding for the next 12 months": We are going to do whatever we can to reduce your funding, not that we gave you enough last time. "We also like to know how the services have been going": We are going to make your child's therapists justify their actions as well, because they aren't exhausted, underpaid and over-run by requests from needy families. "And if there is anything we can do to further support you": They make us say this. We are discouraged from doing further things to support you. "Meeting time can be booked at 9.30am/12pm/2pm": We only operate during business hours to make it as inconvenient as possible for you to attend, thus saving us thousands of dollars because you will be working, seeing as we didn't give you enough money last time. "You will be allocated to a team and contacted by a located area co-ordinator": Oh, I'm not actually TAKING the meeting. I just send emails full of errors including spelling mistakes and misused punctuation so the bar is set nice and low before another seven different people who know nothing about you or your son contact you without reading your file or Googling autism. "Please let me know what date and time would suite [sic] you best": Just kidding. The spelling mistakes aren't deliberate. I'm just so underqualified for this position that I don't know the difference between 'suite' and 'suit'. "Kind regards": Good luck. You'll need it (insert evil laughter).